Ronald Royal Wineteer was born to Royal and Shirley (Naylor) Wineteer way back on October 1, 1944. He loved putting on plays even as a child so it was no surprise that when he graduated from Chadron State College he student taught Speech and Theater in Scottsbluff, NE. It was in Scottsbluff that he met the late, amazing Linda Fellows. They were married in Chadron in 1967 with the cutest flower girl you ever saw. Ron and Linda soon moved to Minot, ND where he again taught Speech and Theater for many years at Minot High School. He was also the ambitious Director/Actor in Minot's Community Theater, putting on grand productions like Camelot and My Fair Lady. When Ron retired from teaching, Ron and Linda joined Chadron's community where Ron became the Director of the Retired Senior Volunteer Program using his unique people skills to make the program a huge success. When he retired from RSVP, he became very involved with the Dawes County Historical Museum. He was also the dedicated Editor of The Golden Age Courier. Ron was the eldest of Royal and Shirley's children, Larry, Rick (and Cindy), Karen (and Steve) Liebentritt. He was so proud of all 21 of his nieces and nephews and greatnieces and greatnephews. When his wife, Linda, passed last year they were one month shy of 50 years together. 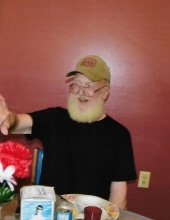 Ron passed away on September 11, 2018 at Ponderosa Villa in Crawford. It was exactly one year from when he lost his beloved Linda. They are reunited.